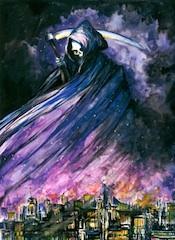 Grim Reaper books for kids feature dark tales that excite the imaginations of older children. Many stories weave fairytales and folklore into new tales about a timeless subject. The Grim Reaper may take many forms and while the figure is mostly associated with adult literature, some stories for younger audiences feature this character. Death is a difficult subject that is not to be taken lightly, especially when dealing with children's literature. Grim Reaper books for kids are ideal for older children who are interested in scary stories. Following are books that feature this ominous figure in nonfiction and as a character in chilling tales. The Grim Reaper by Rachel Lynette is a book in the author's Monsters series. The first chapter offers a scenario in which a dying man sees the Grim Reaper before departing from the world. The dark character is invisible to everyone else in the room. The figure is described as a "harvester of souls" but the eerie scene is quickly followed by objective nonfiction information about the character. This Grim Reaper book for kids is published by KidHaven Press and it is a fascinating glimpse into the subject's origins, characteristics and overall appeal to readers. The Monsters series has volumes that include descriptions about how the character is created for film and television. Some editions have first-person accounts of encounters with monsters and creatures of mystery. The books are written for children in grades three and four. While the image of the Reaper is one most commonly associated with Halloween, Charles Dickens's A Christmas Carol features a phantom that visits Ebonzer Scrooge. This third spirit takes Scrooge on a journey to his own grave in this classic Christmas story. The unwavering spirit doesn't speak, nor does he need to in order to send the haunting message to the main character of the story. The story shares the dark curiosity a person can have about death in his temptation to remove the phantom's hood. "The cover was so carelessly adjusted that the slightest raising of it, the motion of a finger upon Scrooge's part, would have disclosed the face. He thought of it, felt how easy it would be to do, and longed to do it; but had no more power to withdraw the veil than to dismiss the spectre at his side." It is this very curiosity that drives readers to a morose fascination with the Grim Reaper. Whether subtly weaved in a Gothic tale or as a main character, Grim Reaper books for kids serve as a dark reminder of the transient nature of life. Stories featuring this classic personification are among the top scary books for kids.